Today's photo is another view from home, which will most days melt your mind. Because this is my blog about the awesome Adirondack Lifestyle I've enjoyed for the last twenty years, I have license to wax poetic, or simply ramble on, about why I think living in Lake Placid in the Adirondack Mountains of New York is one of the best places in the world to take up space. 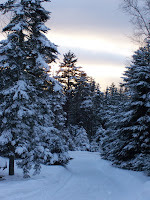 As a matter of fact, highlighting the Adirondack Lifestyle is the purpose of this blog. Because I own property here, I get to ski at one of the best ski resorts in North America, Whiteface Mountain, every day if I choose. I don't have to drive more than 12 minutes to get to fresh powder skiing on a real skier's mountain - an Olympic caliber Mountain. I miss all the fun of dragging my ski equipment through jammed airports and cramming all the "fun" of skiing with my family into one week. Every day is like vacation! Today for example, since I have some work to do later at the Prudential Terry Horrocks real estate office in Lake Placid, I am working now, and will ski cross-country this afternoon at Mount VanHoevenberg, the Olympic cross-country ski trails. I wake every morning to million dollar views, and enjoy spectacular vistas just driving to the grocery store. By the way, the Price Chopper in Lake Placid has the absolute best view of any supermarket I have ever been in. You can bag your groceries while enjoying the Alpengluhen on snow covered Whiteface Mountain. The real danger is getting distracted by the natural Adirondack beauty and putting the eggs in the bag first. Anyway, because I live here and if I had enough energy tonight, I could take a spin on the speed skating oval where Eric Heiden won his five gold medals in the 1980 Olympic Winter Games. That probably won't happen tonight, but I could if I wanted to! I have promised my friends who live and own property here that I would be sure to let readers of my blog know that the Adirondacks are not for everyone. If you can't stand being more than 40 minutes from a mall, then the Adirondacks are not for you. The closest mall is in Plattsburgh, 45 minutes away from Lake Placid. Also, if you are uncomfortable faced with driving scenic, uncrowded mountain roads, the Adirondacks are not for you. If you don't like seeing super-fit athletes training to compete in world-class sporting events like the Olympics or Ironman, then you definitely wouldn't like it here. On the other hand, there is wonderful shopping on Main Street in Lake Placid where I have purchased some most unusual and beautiful things; items not available in any mall I've ever been in. (I grew up in New Jersey, so I know malls.) And those athletes....what a great example and inspiration for all of us adults who prize health and fitness, and for our children who can always benefit from positive role models. That's all the waxing for now, but stayed tuned later in the day when I will reveal the Doonesbury connection to the Adirondack North Country.